Wanna earn a quick $300 bones? We've set up a design contest over at 99designs.com. It's simple. Submit a new logo for Bike Addict, get $300, plus full recognition over here (meaning we'll tout the heck out of your design skills, and give you a lot of web love). Let's face it, Bike Addict needs a face lift (among other things) and the logo will kick off a shiny brand new site with all kinds of new features. Ok, Line Rider isn't a bike game, and has nothing to do with bikes, but it's dang fun, incredibly addicting and amazingly simple. The closest thing it has to biking is the realistic physics in the jumps. You simply draw lines for your "line rider" to ride, and then if you want, draw a world around those lines. There is no limit to the size of the space (to my knowledge), and everything works off of gravity (although there are some "accelerator" lines I haven't played with yet). It's that time of year again. For biking addicts, it's better than Christmas, Hanukkah, Quanza, and Festivus combined. 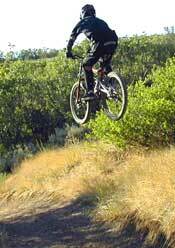 September 25th through the 29th here in 2006, the mountain biking, road biking, bmx, and every other sector of the cycling and bicycling industry will meet in Boulder City and Las Vegas, Nevada for Interbike 2006. Bike videos just don't get any older than this. Although the rider is not actually Thomas Edison, this video was filmed by Edison in 1899!! The rider, named "Neibert", was aparently famous and had a circus background. The footage was shot on a stage with a painted "city" background. I thought it was a misprint when I saw this Downhill Mountain Biking Helmet for $40 over at JensonUSA. I found it in their closeout section. After reading the description on the Azonic T-55 and thinking, yes, I hate small helmets that don't fit my 7 and 1/4 hat sized head, and yes, I hate how my chin is exposed on other full faced helmets, and yes, I hate paying $200+ for a downhill bike helmet . . . I wasted no time in ordering. 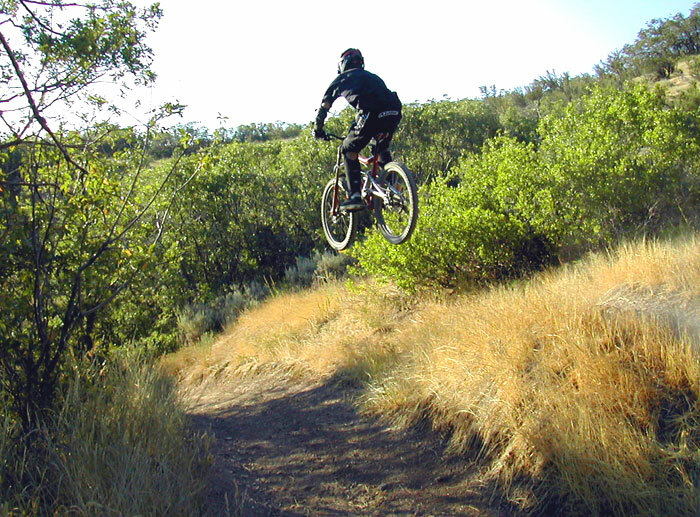 Thanks to Kona Bicycle Company's generous support, seven IMBA clubs will receive $1,000 cash grants to help create new freeriding, downhilling and dirt jumping opportunities. IMBA received many applications for the 2006 Kona/IMBA Freeride Grants, and the field of applicants demonstrated an impressive level of sophistication. Each application featured detailed maps and budgets and evidence of good relationships with local land managers. See the winning freeride locations. 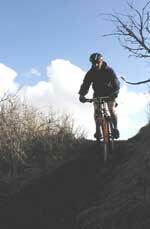 All around the globe there are companies selling vacation and holiday mountain bike tours. Although there are some that have been around for awhile, many are just starting out. Who do you think is worth the money and hard earned vacation time? From the guys that brought you "The Collective" (below). Need I say more? This follows probably the best mountain bike video to date. BodyTeq™ Apparel, Inc., has developed a line of headgear accessories that claim to deliver extraordinary protection against the harmful effects of heat stress and fatique. The science behind it? BodyTeq utilizes Hydroweave®, a unique, high performance fabric that works through evaporation. But rather than you putting a wet towel on your head, this thing will fit nicely under your bike helmet and keep your head cool in temperatures as high as 120 degrees for up to 8 hours. Race Face, again with the help of Giant Bicycles and Manitou Suspension have just completed the fouth annual Race Face Ultimate Freeride Challenge. This year, the winner was a 16 year old freerider from Nelson, BC who has just signed to a sponsorship contract with Race Face, Giant and Manitou worth over $25,000. For 5 days the mountain biking industry will converge on Boulder City and Las Vegas, Nevada for Interbike 2005. Whether it's mountain, freeride, downhill, bmx, road, or anything in between, it will become THE Mecca for bike enthusiasts September 26-30. Interbike will give us riders enough eye candy to last until we can finally get our hands on the stuff next season. More importantly, we'll be able to test all the new products for 2006. Stay tuned and we'll show you the goods. Peat capped a run of podium appearances on the World Cup Downhill circuit with a solid third place finish in Calgary ensuring the overall World Cup title with one race still left on the calendar. He goes into the final round with a 271 point advantage over his closest competitor, Sam Hill. Considering riders can earn a maximum of 250 World Cup points in a given weekend of downhill, its safe to say Peaty has garnered yet another prestigious title. Brian Lopes and Melissa Buhl became the first mountain cross national champions on the slopes of Mount Snow in West Dover, Vermont this last weekend. USA Cycling replaced dual slalom with mountain cross this year. The new format goes to a down to a single track/course, where 4 riders compete head to head over turns and jumps. The top 2 from each heat advance. In downhill, Eric Carter and Lisa Sher retained their series leads despite problems along the way. Todd Wells and Allison Dunlap with their own difficulties also won the national title. Roland Green smoked the competition in x-country, but we only give titles to U.S. nationals you canuck! According to "BikerFox" there are 3 basic moves to prevent crash and injury. In my opinion all of them would result in more, not less damage to myself and my bike, but hey, I'm no expert. Although I have a hard time viewing the photos on his site without laughing, I'm sure there's probably some thing to the techniques he teaches. It's most likely just another example of Eastern U.S. style riding that I'm not familiar with. P.I.M.P. seems to be doing more than making biking videos these days. Seems like they have sole responsibility for the slick design behind Cedric Gracia's new website. "Better Have Broadband" as they'd say, cause the content is as almost as intense as Cedric's riding. Best of luck to Cedric with his newly extended 2 year contract with team Cannondale. Lopes better watch his back for the 4X title. Looks like you'll have to wait till Interbike in Las Vegas this October to see Freeride Entertainments most recent film release "Freewheel Burning". As usual, they just keep producing good film. The teaser of course is great, with bigger jumps, drops, gaps and of course all the big names. I just keep wondering when Mountain Bike videos will start being released at the beginning of the season like ski films rather then at the end. Probably one of the best deals you'll find on DH pants. The 01 and '00 Azonic® Moto pants are on closeout at $49.99 EACH. Created from 100% durable DuPont® Cordura® with oversized Swiss Schoeller® Kevlar® knee area. They each come in black, red and blue and have pad inserts. I picked up the '01 in blue earlier this year and wish I had done so sooner. Already taken a few nasty falls that would have ripped up any other pair of pants I have. The 4th Annual Crest Crank Ride to End Domestic Violence is a fun ride, not a race, on the spectacular 20 mile single track stretch of the Monarch Crest Trail in central Colorado near Salida. 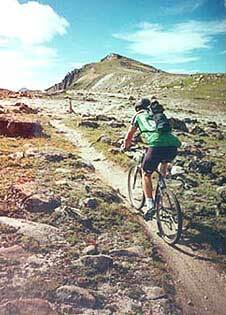 Rider begin at a spectacular 10,000 feet elevation and follow 20 miles of single track along the continental divide. For more info contact Kim Wood @ aada@amigo.net or (719)539-7347. SNOW SUMMIT, Calif. - Paying attention to changing course conditions helped secure a downhill victory for Chris Kovarik (Intense/Foes) at the first round of the Chevy Trucks Nationals. SNOW SUMMIT, Calif. - In what may be the last big league dual slalom mountain bike race, Anne-Caroline Chausson (Volvo/Cannondale) and Wade Bootes (Trek/Volkswagen) showed off the form that earned them world titles. Rocky Mountain Bicycles is recalling about 660 Slayer and Edge full-suspension mountain bikes, due to reported chainstay failures. Rocky Mountain received one report of an incident where the rear wheel separated from the bicycle. The recall involves 16.5, 18 and 19-inch Slayer and Edge bikes sold through specialty retailers from January 2001 through February 2002. The Slayer is black with red Slayer and Rocky Mountain decals on the toptube and downtube. The Edge is royal blue with yellow decals on the toptube and downtube. Bicycles with the letter "S" stamped on the chainstay yoke are not involved in this recall. For information contact Rocky Mountain Bicycles at (800) 663-2512 or Rocky Mountain Bicycles. I used to think I knew what the perfect trail was. It was behind my house, easy access, had lot's of rollers and then ended with a big drop called "death hill", followed by a huge jump. Of course I was 10 at the time, living in Pleasant Hill, California, and my world had a 15 mile radius. 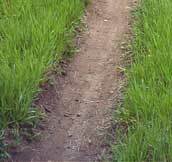 Over 20 years later, I still look for "rollers", "big drops" and "huge jumps", but I don't think that's all it takes to be the perfect trail . . .
Pads aren't gonna make you a better descender though . . .